Psycho Solo Diver – Online Diving Blog and more! 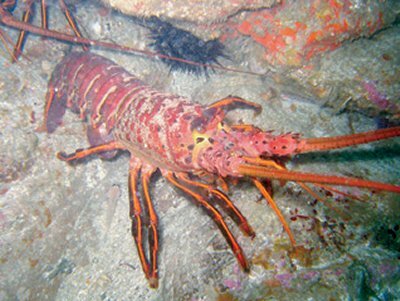 » Global Warming Is Good For Lobster Growth? Global Warming Is Good For Lobster Growth? I guess there could be some positives if this global warming thing is really true. Thank you Crazy Ivan for pointing this out. CHAPEL HILL, NC — Scientists report that global warming and increased greenhouse gases have made the ocean 30 percent more acidic, negatively affecting coral reefs and small marine organisms — and scientists predict that the seas will be 150 percent more acidic by 2050. So, you might ask, is there any good news to come out of current global warming research? Maybe — if you’re a fan of lobsters, crabs and shrimp. New research published in the science journal Geology indicates that rising atmospheric carbon dioxide (CO2) levels can dramatically increase the size of lobsters, crabs and shrimp. Scientists at the University of North Carolina at Chapel Hill found that seven of 19 shellfish species observed in an environment with highly elevated carbon dioxide levels grew bigger, thicker shells — and grew up to 50 percent larger than similar shellfish in waters with current atmospheric CO2 levels. However, clams, scallops and oysters observed in the study did not adjust well to the high CO2 conditions, and appeared to grow weaker instead of stronger. Researchers said they do not know whether the lobsters’ tissue expanded as much as their shells did — and, reportedly, none of the shellfish study subjects were cooked and eaten to determine whether greenhouse gases had any effect on food value and flavor. The link to the original article can be found here.